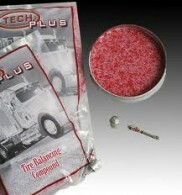 New Improved TechPlus Tire Balancing Compound. Tech Plus has micro beads larger and smoother than the old style. The new micro beads are specially coated to enhance flow ability, and to avoid (static cling) sticking to the inside of the tire. This eliminates the need for extra powders. The larger micro beads are carefully calibrated and will not block TPMS sensor holes. A filtered valve core will no longer be required, but may still be used.